I started my spring cleaning today....finally. I began in the front room and that's all I got done today as I also had to put away my Easter decorations. 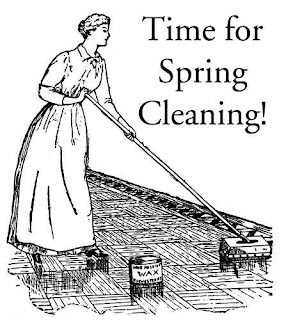 I'm taking my time and really doing deep cleaning. I need to stay off of the computer so I'm not distracted. Everything smells so fresh and clean. It brings back memories of my mom and how she taught me how to keep a house. Thanks mom! I hope to make more progress tomorrow. I did a wee bit of gardening today after I spent some time with my dad. I noticed lots of my Forget-Me-Not sweet little blue flowers were everywhere. Tasha Tudor loved these little gems and when she passed away, I spread tons of seeds in my flower beds. They have been coming up every year and they make me happy. So, I thought it would be a great week to feature my Royal Albert Forget-Me-Not teacup for Miss Spenser's Teacup Thursday. I really like the shape of the cup and of course, the colors are lovely. When I was outside today, I snapped a couple pictures from my garden to share with my blog friends. Look who's peeking at the beautiful teacup! It's a corgi...a Tasha Tudor corgi. Perfect color too. The corgi was produced for one of Tasha's companies in the past. He's quite charming and well made. It's marked Tasha Tudor on the bottom. I am hoping that the weather will cooperate and warm up next week so I can start planting my flowers. I always make myself wait until May and I'm ready to go. 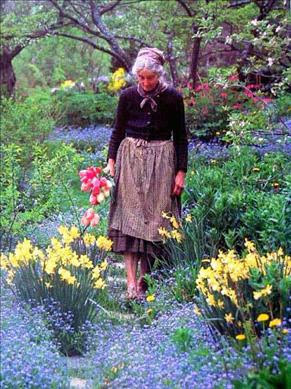 Happy planting and think flowers. Yesterday I had to do a few errands and drop my Etsy packages off at the Post Office. I was just taking a break, wondering around the store a bit and I ended up in the music department. 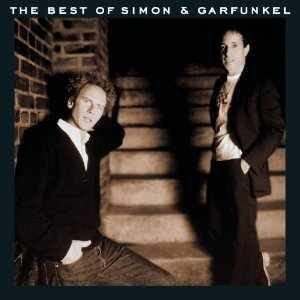 I remembered that I wanted to buy a Simon and Garfunkel CD for my car so that I did! I chose this one...wanting to get all the best of the oldies. Oh boy....turned the music up loud and drove back home on a beautiful 80 degree day as my mind drifted back to another time. Ahhhh....loved it. So many memories along with great songs. I've been so busy trying to post all my Etsy things that my poor blog has been a bit neglected. The retail in me just wants to get everything posted and keep those sales coming. My teacup for today's Teacup Thursday is a very dainty and softly painted Haviland piece. 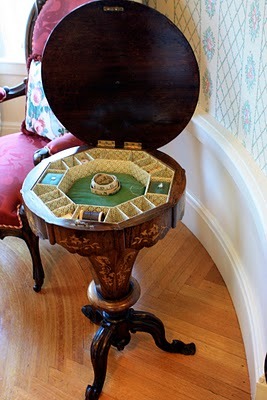 Jim and I were at an estate sale last weekend and I just loved this sweet little set. It's such a very pale cup and saucer and although there isn't a name on it anywhere, I do believe someone painted it. I don't know why I was drawn to it, but it just called me...take me home and so I did. I did a bit of clean up work in my yard on Monday when the weather was nice, but the rain returned and my handyman didn't make it back to finish up, so I'm on hold again. I am getting ready to get those flower planted and getting excited. I pulled out one of my Tasha Tudor books....an Emily Dickinson's books that Tasha illustrated. I love all the flowers and enjoy looking at the pictures. I love Emily Dickinson's poems. Don't you just love the last line...into my garden come? Weeks ago my friend Judi contacted me about helping her make a quilt for her daughter's baby. Judi had never quilted but she so wanted to make a quilt for this new grandbaby and had very definite ideas about what she wanted! I was a bit hesitant to jump in but I wanted to help her, so....Her daughter loves sailing and Judi wanted to pick a pattern that would have a sailing feeling. The fabrics she chose are so cute. I love the little bear print with the nautical theme. The hardest part was using the Minkee fabric. It's so soft and perfect for baby, but as every quilter knows, it's a nightmare to sew! Judi and her DIL had it in their heads that they wanted to use it in the quilt, so I went along with it. I had never sewed on it before! I really admire them and they did such a good job on it for beginning quilters! Right in the middle of all of this, dear Judi had to have some surgery too. She still hung in there and we got it done. Her DIL knew someone who helped them long arm it and I put the binding on it for them. I felt like a proud mama when it was all done! Congrats Judi and well done! I hope you'll be wanting to join me now...you are a quilter!!! I posted this picture before on my blog, but I just think this should be included with this blog so everyone can see Judi with her quilt. I was reading through the Victoria magazine that arrived this week and I have to admit, I've been a bit disappointed with the magazine since it's been reissued. I loved the original magazine and have all the back copies! 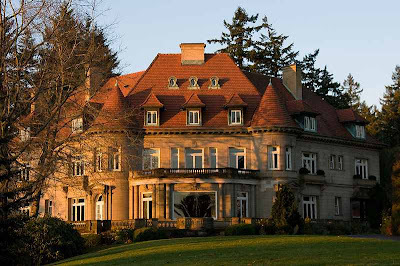 I was thinking to myself that even the photography doesn't measure up to what it once was, when I flipped the page over to an article on the Pittock Mansion in Portland. Of course, I got all excited and decided well, maybe the magazine is OK after all. 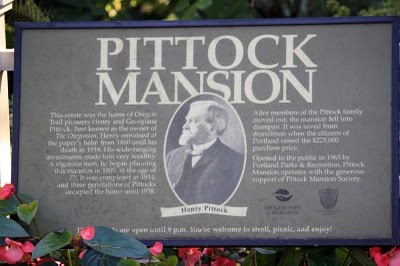 The mansion was finished in 1914 by Henry Pittock who was the owner of the Oregonian paper. His wife Georgiana founded the Portland Rose Society and helped to start the Portland Rose Festival. It sits high up in the West Hills and has quite a view of Mt Hood. It's a beautiful home and it's always fun to visit. The magazine article is quite nice and actually made me want to go visit it again! I don't have a Portland OR teacup, but I do have two sweet demitasse cup and saucers that I can show for Miss Spenser's Teacup Thursday. Both are inscribed Souvenir of Portland Oregon. 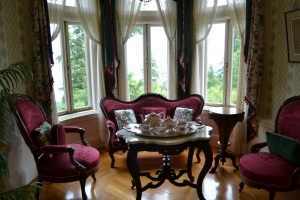 My friend gave me a a book a few years ago from the gift shoppe at the mansion~Afternoon Tea at the Pittock Mansion Recipes & Reminiscences. I love the photos from the family that are included with wonderful recipes and stories. The sewing room is one of my favorite rooms in the home. It's so pretty and I love thinking about the ladies meeting and sewing for charity. 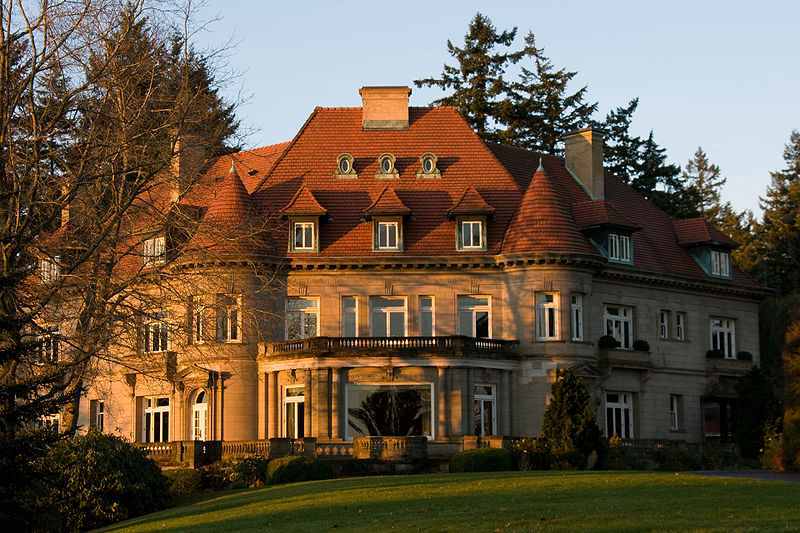 If you get to visit the beautiful Northwest and come to Portland, it is well worth your time to take in the Pittock Mansion. The gift shoppe is very nice too. If you happen to be here in December, the mansion is always decorated according to the theme for the year. Easter and Belated Teacup Thursday #52! Happy Easter! The day was so beautiful here in Oregon...that kind of day which holds a promise of spring and hope and JOY. It was a bit different for me and I think it was good to be alone. I thought I would be with others, but it didn't work out so I decided to spend it alone. Time to read scripture and time to think about my faith. I stumbled on the movie- The Passion of Christ- tonight. I have never seen it before. I'm still soaking it in or trying to anyway. Powerful and very humbling. My mind drifted to all the services I have attended in the past...memories. I talked to my daughters and to my Jimmy on the phone and I certainly missed them all today. These are Easter cakes our family makes every Easter. We call them Blarney Stones as they started off years ago as St. Patrick's Day goodies. They're cupcakes frosted all around and rolled in coconut or nuts.They are rich but very yummy. So after my bible reading this morning I had a little breakfast...hot cross buns and good coffee and an egg for protein. My dear friend Nancy dropped off a basket of flowers and treats yesterday. Isn't it pretty to see the sun shining early this morning? The mailman brought my mail back yesterday that was being held for me while I was at the quilt retreat. I had a whole PO tub full of packages and was anxious to open them today. 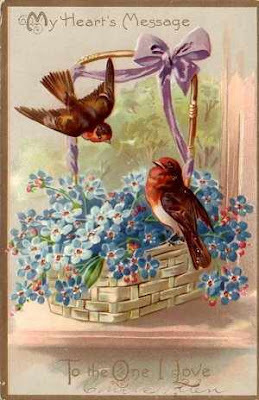 Robin had my name in our Tasha Tudor Easter exchange this spring. Our theme was birds and I love the bird on the spool....so perfect for me. Thank you Robin. Then I opened all my other treats from New England, Virginia, Kansas, Montana and Portland. Sweet thoughtful Tashettes and friends. So fun and it really cheered me up. I didn't get to participate in Miss Spenser's Teacup Thursday last week so I decided to add this to my Easter Sunday. It's called Spring Song by Queen Anne, English made "fine" bone china. This is #52~an entire year of featuring teacups! I guess I should have a party or better yet, a little tea party of my own! Isn't the cup so pretty and springlike? I also like to collect porcelain eggs.I found the daisy one at a shop in Troutdale last week! I enjoyed beef and marinated asparagus roll ups, goat's cheese on rice crackers, a Blarney Stone (of course), Grand Marnier drizzled orange slices, a wee glass of Port and a cup of vanilla Rooibos tea from a new tea shoppe in Portland. My friend Jan made the little bird in front of the tea package. Today is my dad's 83rd birthday! We will celebrate later in the week. Happy Birthday Dad! Easter Blessings to you all. My prayers are with you and I thank God for your friendship. My friend Ina took this picture of us at our last dinner at the beach. We had such a wonderful time. You can see more pictures on my Facebook page. I posted an album. It's good to be home but I am missing Jim. He'll be home on Tuesday. I spent the day doing laundry, packing and mailing Etsy orders, putting Easter baskets together, shopping and just catching up on everything. We sure had a great time. I finished a baby quilt and my 30's/40's UFO top that I've been packing around for years!